Is Kodi not working for you? The solution is often easier than you might think. In this article, we’ll be showing you how to fix Kodi problems including freezing, crashing, buffering, and video playback issues. We’ll provide some guidance, direction, and insight into common problems you might face when using Kodi. It’s always annoying when Kodi runs into a problem. It’s often difficult to find the root cause of an issue on your own. While the most common advice given is “check Kodi’s logs”, they’re often unhelpful and can be confusing to the point of uselessness. The good news is that most of Kodi’s problems can usually be fixed in just a few minutes. This guide will help you troubleshoot and resolve some of the most commonly encountered Kodi issues. With luck, your problem will be fixed and you can get back to watching your favorite TV shows and movies in peace. It’s important to note that third-party addons are less stable than official ones. They are notoriously unreliable and often come with their own problems. Additionally, third-party addons usually use unlicensed sources. For these reasons, we advise our readers to use only official addons and seek properly licensed content wherever possible. 2 What are some of the most common Kodi problems? VPNs are often used to hide unlicensed streaming from a user’s internet service provider (ISP). Despite this, using a VPN can greatly benefit people who only use official streaming sources. VPNs work by encrypting a user’s internet traffic. This prevents it from being accessed by any outside observer. This renders the majority of Man-in-the-Middle attacks useless and also prevents your ISP from throttling your connection based on your browsing habits. Every VPN will slow your connection down to some degree so it’s important to find one that has minimal impact on your browsing speeds. Also, some VPN providers keep detailed logs of your activities. This greatly reduces the level of privacy you can expect your VPN to provide. We recommend using IPVanish. It offers fast, consistently stable connections to servers across the world. Further, it’s one of the easiest VPNs to install on an Amazon Firestick or other mobile platform, and keeps no logs of your network traffic. What are some of the most common Kodi problems? Kodi is one of the most portable media center software packages and can be installed on a huge range of devices including Roku, Apple TV, and Nvidia Shield. However, while Kodi works in a similar way across platforms, each device has different system resources, user profile folders, and subroutines. This can make it difficult to troubleshoot Kodi. For example, you may run issues while trying to fix Kodi on your Firestick that never occur on your Android app version of the software. While the solutions below work in most cases, we can’t guarantee that they’ll address the root cause of a problem across all Kodi installations. If Kodi is consistently crashing or freezing that’s a sure sign that something has gone wrong. First, consider when this problem began and what your actions were just prior to this. If the issue started after you installed a particular addon, try uninstalling it and see if the problem persists. Likewise, if you just installed an addon update or customized Kodi build you might want to uninstall this to remove it as a potential cause. Hardware acceleration is one of the main causes of Kodi crashes, particularly on Android. You could try turning this option off to see if the issue goes away. Doing this is simple: from the Kodi home screen, click the gear icon to go to the settings menu. Next, click Player settings. At the bottom of the page, you’ll find another gear icon with the word “Basic” beside it. Click this three times and it should turn to “Expert”. 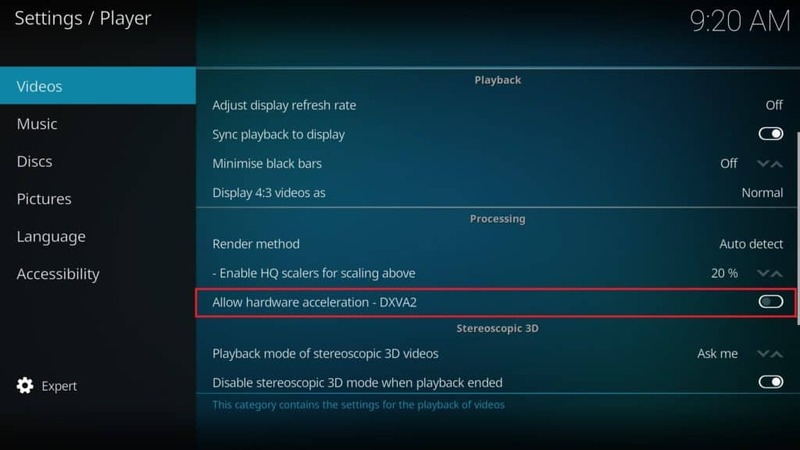 Now highlight the Video tab, scroll down to the bottom of the list on the right and disable the Allow hardware acceleration – DXVA2 option. Restart Kodi and see if the crashing persists. When Kodi plays streaming videos, it downloads a few seconds at a time to the cache. This allows for faster access and smoother streaming. However, when the cache fills up entirely it can cause Kodi to behave erratically. Choppy video is a tell-tale sign that the cache is getting full and although the cache usually empties itself, sometimes it needs to be flushed manually. Kodi doesn’t have any built-in tools that allow you to do this, so you’ll have to install the Ares Wizard addon. Once installed, click the Maintenance tab, then the Delete cache\Temp button on the right, about halfway down the screen. If you’re looking for a different maintenance option, TVAddons also provides an addon called Indigo that works similarly. You’ll find a cache-clearing tool there was well. If the steps above haven’t solved your issue, you might want to consider a fresh Kodi installation. 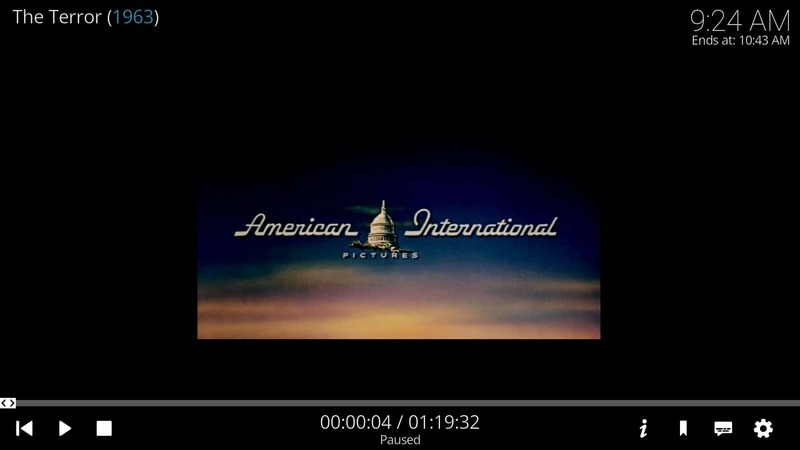 You can either do this manually by downloading your preferred version from https://kodi.tv/download or by using the Ares Wizard’s Fresh Start option, found under the More tab. There are a few reasons why Kodi might get stuck in a crash/reboot loop. 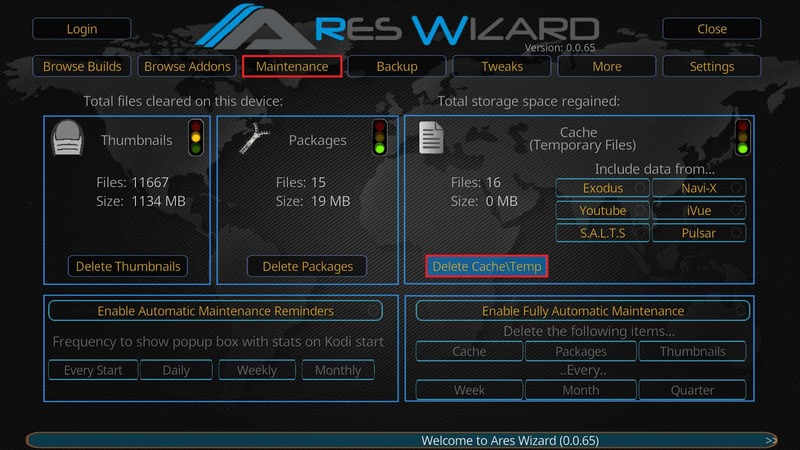 If you’ve installed any custom builds recently, they might be the culprit and should be removed using the Ares Wizard. If this doesn’t resolve your problem, try disconnecting your computer from the internet. The reason we suggest this is because the URLResolver dependency often causes problems and if Kodi does not have internet access, it can’t do its job. If this stops your crashing issue, try updating it by clicking the gear icon on Kodi’s main screen, then System settings. Next, scroll down to the Add-ons tab and click Manage dependencies. Click URLResolver, then click Update. If this doesn’t work, you can either uninstall addons until you find the one responsible for the crashes or just reinstall Kodi to start again with a clean slate. Kodi repositories are usually installed by providing a path to the source. Sometimes you might find that once the source has been added, you’ll see a popup telling you that it couldn’t be accessed. This is usually because the source address is incorrect. Check it and make sure you’ve entered it correctly. Common mistake include misspellings, not using the proper letter case (e.g., inserting upper or lowercase letters where they don’t belong), forgetting to include “http://” at the start, and in some cases, missing the repo’s file extension. If the address has been entered correctly, more often than not, the repository has gone offline or been moved to a new address. You can test this by opening the source address in your browser; if the folder is empty or not found, that’s the root of your issue. Try researching the repo to see if it has been moved but bear in mind that alternative hosts are not always trustworthy. If you’ve managed to install a repo, but an addon fails to install, there are several possible causes. The addon may be outdated or no longer supported by its developers. In this scenario there’s very little you can do. Older versions may still be hosted elsewhere, such as the SuperRepo repository, but these aren’t guaranteed to work and the older an addon gets, the more risk it poses to your system when installed. Additionally, older addons may not work with newer versions of Kodi. New Kodi versions in the past have changed the way the software reads and process addon code, making some older addons obsolete with newer versions of Kodi. It’s also possible that the addon has uninstalled dependencies. These are additional addons that are required for the initial addon to work. That said, addons that have these dependencies are not official and pose a significant risk to your system’s security. For this reason, we’d advise against installing them in the first place. At times, you may find a build or a specific Kodi addon causes a conflict with your Kodi installation. If that occurs, you may try to load up Kodi, only to have it crash every time. Thankfully, Kodi addons can be deleted from outside of your Kodi interface. If you need to delete a Kodi addon, you can do some from your %APPDATA%\Kodi\addons\ folder. If you’re unsure which plugin is causing the issue, try deleting your most recently installed addons or repositories and loading Kodi to see if it works. If worst comes to worst, you can delete as many addons or repositories as necessary without causing any harm to your base Kodi installation. You may, however, need to reinstall your addons again later. The majority of the time, a weak network signal or slow internet speeds are the cause of streaming problems. This has been covered in more detail in our Kodi buffering article, so it might be a good idea to start there. If you can’t find any problems with your network, there might be another cause. Certain content providers restrict access to their videos using a process known as geo-locking or region-locking. This checks the IP address of anyone attempting to view the content and rejects the connection if the IP address isn’t from a particular location. The good news is that this is easily bypassed. Users can connect their virtual private network (VPN) to a server in the correct location and will be able to access the previously restricted media. The correct server to connect to is usually fairly obvious: the BBC blocks anyone that isn’t inside the UK, NBC blocks those outside the US, and so on. Color issues are far less common and are not necessarily unique to Kodi. If the colors are slightly off, the problem is likely due to incorrect monitor settings. This issue isn’t always immediately apparent and may only be obvious with select videos. This is because every monitor’s color profile is different. Most will have a button on the front that grants access to a picture options menu. However, if your monitor is properly configured, there are other possible solutions. If your video is too large or too small, you’ve likely zoomed in or out accidentally. While playing a video, click the gear icon. Next, click Video settings. Look for the Zoom amount option—if it’s anything other than 1.0, that’s the problem. Make sure that the View Mode is set to “Normal” too. It’s also worth checking the Brightness and Contrast values. These should be at 50%, and if they aren’t, they’re likely what’s causing your video to look strange. There is a little-known error that can cause your Kodi addons to not perform searches, updates or streams correctly. For example, you may find that some addons can’t pull any newer or older content, even if it normally should be available. If this is the case, try checking your device date and time. Particularly if you’re using set-top box purchase through Amazon or eBay, there’s a chance the date and time are incorrect. Kodi and its addons utilize the system date and time to correctly pull data. If that information is wrong, you may in-addon searches may pull in bad results or limited results, and it may even impact your streaming or addon updates. There are a few issues that could be causing a black screen on startup, or creating a blank screen in during regular Kodi operation. One relates to the those who are upgrading from Kodi 16 to version 17+. The change from the Confluence skin to the new Estuary skin may cause you to experience some errors related to the Addons.db file. Consequently, the fix for this issue is to delete your Addons.db file, which just caches information on your addons. Don’t worry, deleting the file will not delete any of your addons. Alternatively, if you’re using an Android box or an Amazon Firestick, you may want to Force Stop Kodi, and then Clear Cache in the app settings. This should also help clear up the issue. If you’ve been using Kodi v.18 Leia, you may find that the search function in your addons is not working. This is because you may be using addons that have not been properly updated for Kodi 18. When you use an addon search function, that addon caches information so that you can easily retrieve a result from the search. Kodi 18 changes some of the Python code requirements for the search function, making it so that any addon not properly updated to match will fail to have its built-in search function working. There is nothing users can do to fix this problem. You must wait until the addon developers update their code. To date, most addons have no officially updated to work with Kodi version 18, so you may have to wait a bit longer, or keep using Kodi version 17.6 Krypton until more addons have been properly updated. There are a number of issues related to streams stuttering. For example, your internet speed may not be fast enough to handle the 4K or HD stream, and this may result in more buffering. However, especially with 4K, there’s a good chance your device may not be able to handle the higher quality video. Do a quick Google search of your specific device. Especially if you’re using Kodi on a Firestick, if you’re trying to process 4K streams you will get stuttering. This is also true if you have an older Firestick and you’re trying to get 1080p streams. There is a new Amazon Fire TV stick coming out in October that will be able to handle 4K streams. The Fire TV Stick 4K will be available on October 31. Considering Kodi can be installed across a wide range of different devices, it’s actually easier than you might expect to troubleshoot. In fact, the most commonly seen Kodi problems can be solved relatively quickly. By the way, if you’re running into issues with Kodi on a Fire TV Stick, we’ve got a troubleshooting article just for you. Hopefully, this guide has helped you resolve your issue and if there’s a quick fix you’ve found that we haven’t mentioned, feel free to let us know in the comments.